I finally finished my pin board!!!! If you follow me on Facebook you know I've had a few bumps along my pin board path. First, the photo below was my inspiration for my pin board. I was going to make a custom shape to fit my space and just wrap the fabric around it and use nail head trim to repeat the shape. But when I got serious about cutting out the shape I just couldn't get a polished picture in my mind. I was afraid it would not look right. So, down to the basement I went looking for something to spark a new idea! Anyways I found this huge old frame I had bought at DI a few years ago!! This frame is 30" x 42", good sized. Mind you it's not much to look at with this old sloppily painted canvas complete with some sticky substance that ran all the way down the front. I was not planning on using the canvas so no problem. I did see beauty in the frame, although it too had some problems. Besides being dirty, and covered with the sticky substance in spots, the filigree was missing in two corners and a few spots on one edge. But I was up for the challenge!! 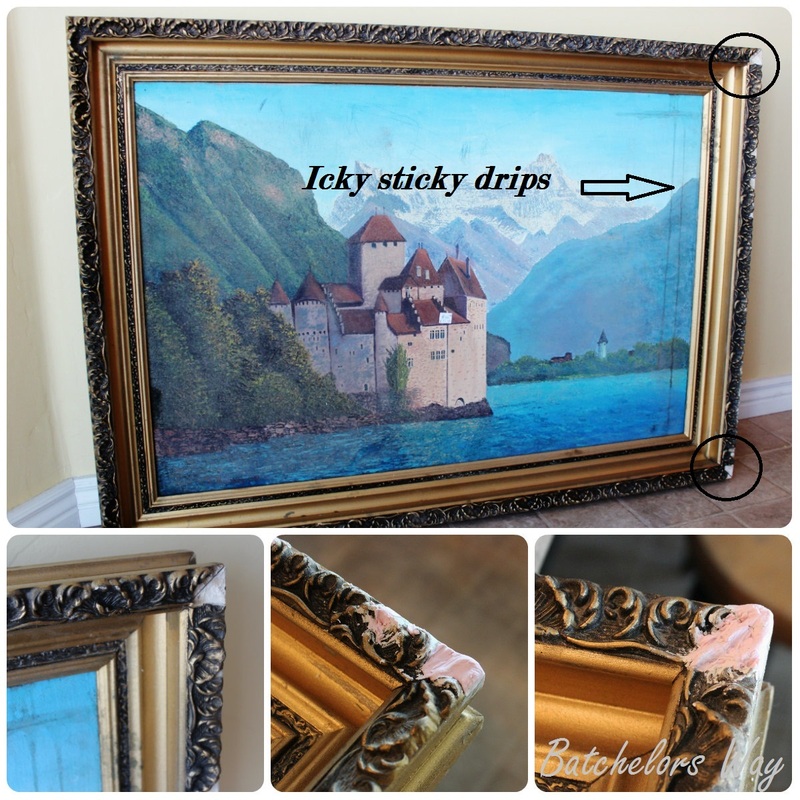 I took out the ugly old picture and cleaned the frame with some soapy water and an old tooth brush. 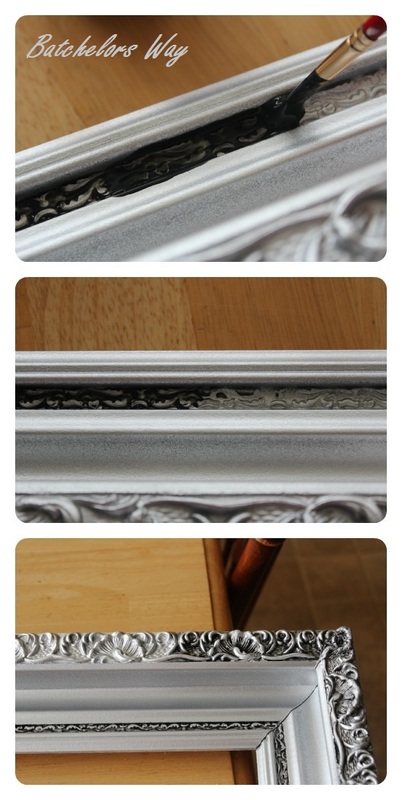 I used DryDex Spackling and filled in the voids on the frame. I tried to carve it as it dried. Not really sure you could call it carving, more like pushing it around with odd tools and my fingers. Then I waited for it to dry. I thought it worked pretty good, but I was really convinced after I saw it primed and painted. With a new shiny coat of Krylon silver spray paint the frame was really looking nice and rich , but I wanted to bump it up a bit. I used a Black Apple Barrel Acrylic Paint mixed with a glaze on the small filigree strip and carved edge. Let's leave the frame and move onto the pinning part of the venture. I cut a piece of half inch card board that came off the back of the book shelf we bought for the built-ins. Go here to see it. That means it was free!!! I then bought a package of 4 cork squares for $9. I also snagged this great gray curtain from Target on clearance for $9. 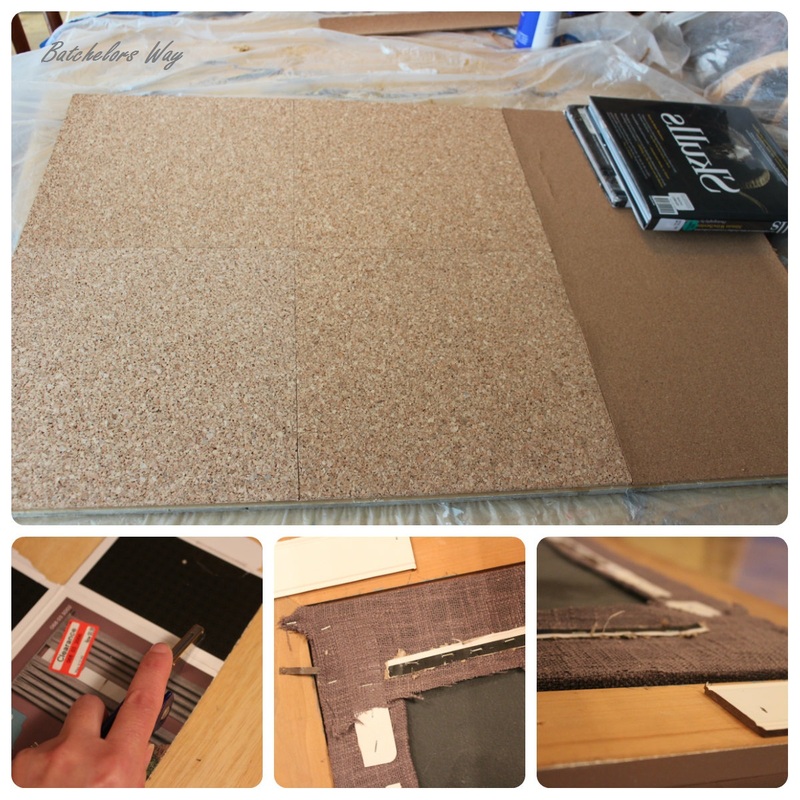 Once I had all my supplies I started to assemble the pin board. I glued the 4 Cork Sheets onto my card board base. I used a small left over piece of rolled cork my neighbor gave me to finish it off. I covered the cork and cardboard base with my great curtain find. The curtain is nubby linen like material which makes it easy to push pins in and leaves no holes in the material. On the other hand this loose weave made me nervous that it wouldn't hold when stapling it. I cut the cardboard that came with the curtain into small strips to staple through for a stronger hold. After it was all covered I popped it in the frame and realized the covered board was sticking out the back about 1/4 inch. Solution: I added thin scraps of bead board to give me a more level surface on the back. Now I just had to install my lovely new creation!! My choice was to use Command Velcro strips. Worked great for about 1 minute! Then it just fell off the wall onto the desk. Popping off the newly fixed corners!! Apparently the back was still not flat enough. see the nails; no touch up needed. As for the broken corners, they actually popped off in one piece making it easy to glue them back on and touch up with a little bit of paint!! 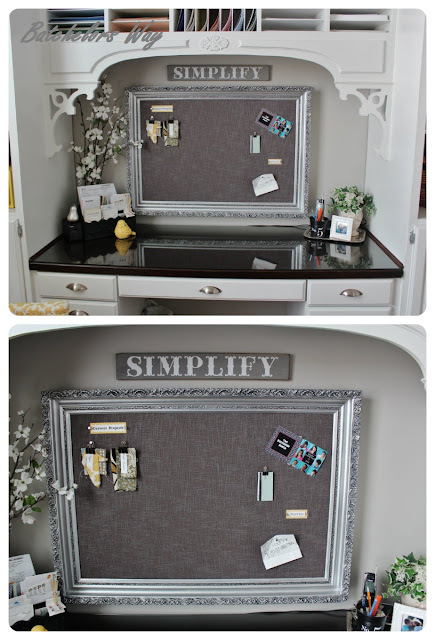 To finish off the space I added this gray Simplify sign. go here to see how she made it. Now lets just take a gander at this lovely new pin board up close and personal! 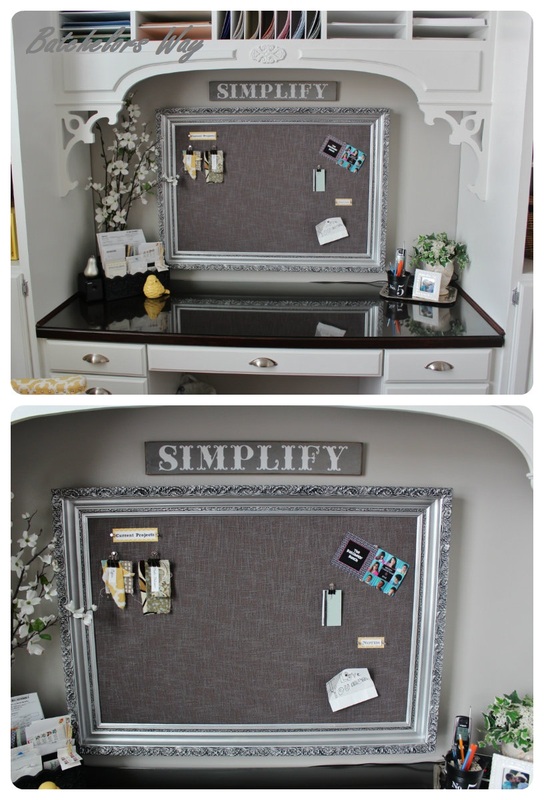 I love how my neighbor Shelley organized her projects ideas on her pin board so I organized mine in a similar fashion. even though it was not my original idea. Just shows that going with the flow can be the best option. It's so big and pretty and functional. Can you tell which corners I fixed? 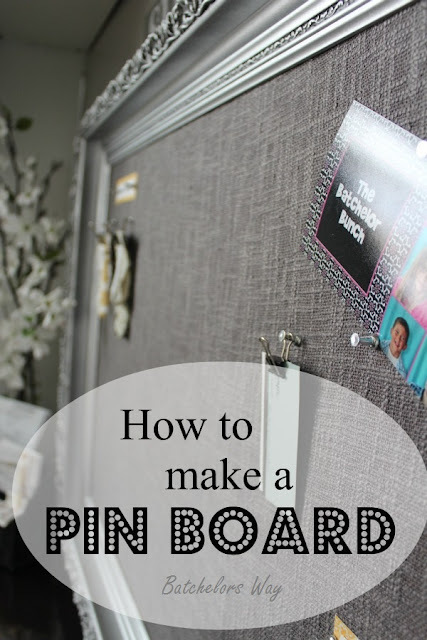 Would love to hear if you have made a pin board. I'm so close to getting done with this office! It's stunning! I love the color, and the details with the black paint are gorgeous. The fix is perfect, even if you are looking for it you wouldn't see it. Can't wait to see the whole office. This is BEAUTIFUL! I'm jealous of your whole desk area--gorgeous. I found you at the Sassy Little Lady "Show and Tell Saturday" party. Thanks for sharing your creativity with us! I love it! You did a great job! I've been wanting to make my own and now I know how. Thanks for sharing! Ronda, that's a very sophisticated pin board! I love the frame's new color, the whole desk area looks fabulous! Love it! It's so sophisticated & beautiful! Love this! I especially love the idea of using a curtain to cover it with. Genius idea! Can't wait to see the whole reveal. Happy Monday! DI stands for Desert Industries which is a thrift store run by the Church of Jesus Christ of Latter Day Saints. They are all over Utah. This is so inspiring! I just love the work you’ve done with the pin board. It looks flawless. Congratulation on your work, thanks for sharing and we’re waiting for post of your next home project renovations. So gorgeous - found your blog through Better After and will enjoy reading it. Can you tell us what types/color of paint and glaze you used? 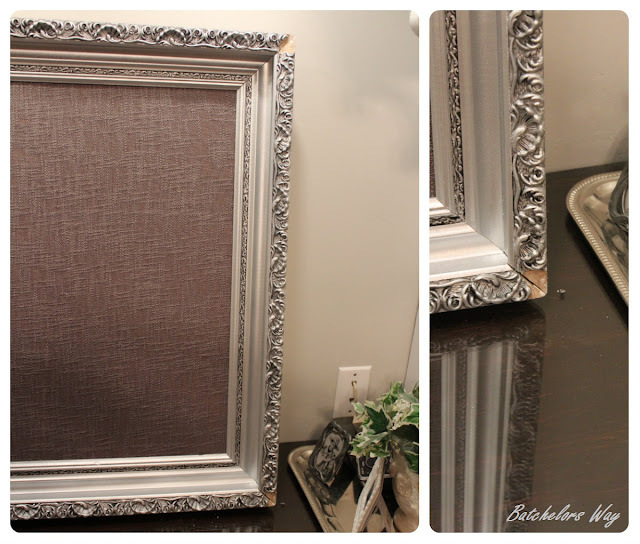 I used Krylon Metallic Brillant Silver spray paint and black craft paint mixed with Valspar Clear mixing Glaze. 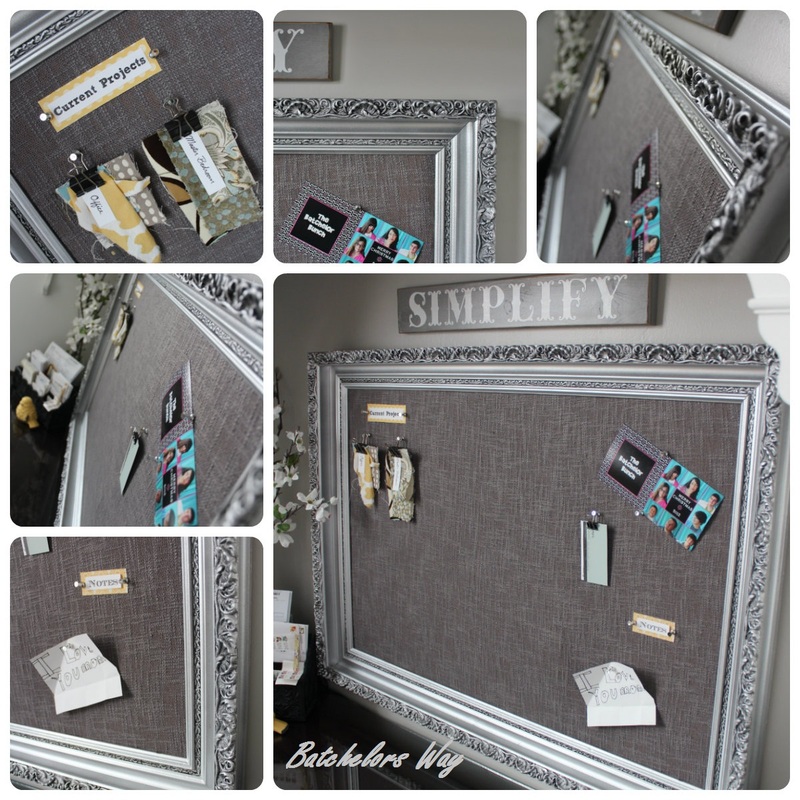 Love the pin board, but i"m so sad you destroyed that beautiful painting:) LOL! I want one of these in my kitchen! I forgot to say I am featuring this at somedaycrafts.blogspot.com. This is gorgeous! 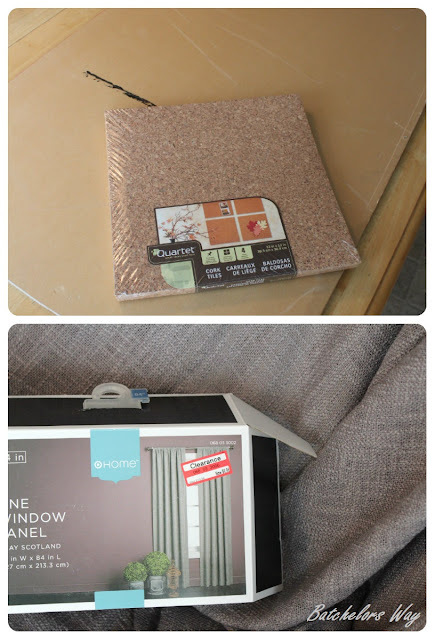 I have been looking for a way to spice up my cork board! We are your newest follower! We hope you will stop by our blog. Very refreshing take on this concept. Love all of your helpful tips along the way. So classy. Ballard Designs & even Pottery Barn really charge 100's of time over their cost to make something not even as classy as yours. You rocked it. Thanks for sharing. Love it! This is exactly what I was looking for. Thanks for the Idea! Love this. I've bee looking for an update to a corkboard for my office. Love the grey! Love it!! I have an old frame my son brought me from the container waiting on the to do list, but your has given me a good idea. Thanks!! Anyway, what is the store you mention all the time? "DI"
I love this pin board! I've been looking around for a DIY pin board for some time now, and this is definitely my favorite! I'm going to try doing this myself in the next few weeks when I have all my supplies ready. I just don't understand how you used the black paint to create that beautiful contrast. Can you please explain what you did? this is fantastic - thanks for the inspo!